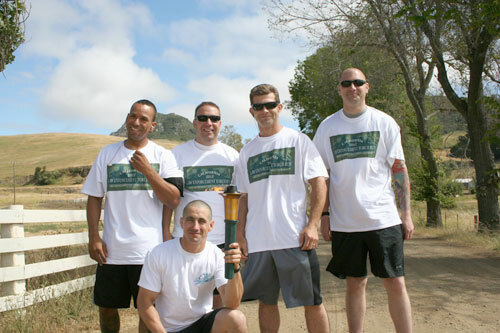 Five staff from the California Men’s Colony joined more than 260 law enforcement personnel and their families from 20 other San Luis Obispo County agencies to carry the Special Olympics torch on its two-day, 74.8 mile journey from Paso Robles to Santa Maria. The torch was handed off to the Santa Maria Police Department for its next leg through Southern California, en route to the Southern California Special Olympic Games in Long Beach on June 9. In 2011, San Luis Obispo County Law Enforcement Torch Run events raised more than $80,000 with activities that included the “Tip-a-Cop” events, CMC tri-tip barbeques, and “Torch Run” participants and sponsors. San Luis Obispo organizers obtained donations exceeding $180,000 in 2011 through other fund-raising activities that included barbeques, sporting tournaments, car washes, and numerous other events. The Torch Run was conceptualized in 1981 by organizers in Kansas and has grown into a worldwide law enforcement event generating more than $42.6 million in 2011.